Sony announced a new 13.3 inch e-reader last week that uses technology the company developed internally and in conjunction with E Ink Holdings. The new Sony e-Paper reader will seriously appeal to anyone that has lamented that their PDF reading and editing experiences have been sub-par on six inch devices. At SID Display Week in Vancouver, we caught up with Giovanni Mancini, the head of RND at E Ink, to check out the new Sony e-Reader. This was the lightest device I have ever played with in the history of e-readers. The 13.3 inch screen is beguiling to behold and you would figure from looking at it that it would weigh significantly more than the Kindle DX. In truth it weighs only 12.6 oz, compared to the Kindle DX, which weighs a hefty 18.9 oz. The e-paper screen glides like a feather when dropped, as I found out. The screen itself is quite respectable in terms of resolution and pixel density. The resolution on the display is 1200×1600 with 150 PPI. 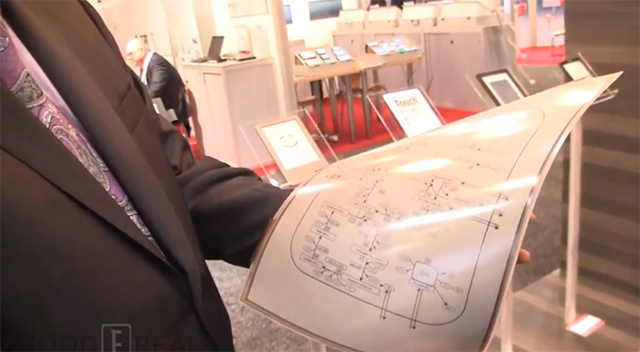 It is dubbed Mobius by E Ink and the company is actively shopping it around to the who’s who list of the e-reader world. The main attraction is using the active digitizer and interacting with complex PDF documents. You can edit documents by jotting down your own handwritten notes, or even highlight passages to go back to later. The large screen display will simply give you the best PDF experience you have ever had on an e-reader. I have personally reviewed over 83 different e-readers since launching Good e-Reader in 2009, and this was the first one to give me a quality PDF experience. I have received emails from airline pilots, heads of research divisions, and publishers about what device they should buy to read their PDF Files. I would implore everyone to buy this Sony one when it comes out; it changes the game. I don’t normally gush about things like this, but when it comes to school, work, newspapers, gaming guides, and technical PDF documents, this is solid. The software right now is quite buggy, and we often found ourselves hitting a function key many times before the feature loaded up. The digitizer pen has a small button it that allows you to erase things when pressed. One of my concerns, along with some of the other media people there, was that the “erase” button was placed where you naturally grip the pen. This may result in you pressing down on it during your natural tendency to grip the stylus like a pencil. We noticed that when you are holding down the button, you can’t launch any commands or click on any of the GUI buttons. This forces you to write on the e-reader in a very unconventional way that may take some getting used to. e-ink moebius allows arbitrary sizes. but lets see how that turns out, thanks for keeping us informed, michael! Hey Mike, Nice post. Just a quick question – did you happen to check the PPI’s on these displays? Are they going to target the current generation Paperwhite resolution or does the large size means a compromise in sharpness/quality? This will never work until the refresh rate on Eink displays improves dramatically. I don’t see any improvement in this prototype. michael – great for this info. Is there any news about WHEN this device will become available e.g. in Europe? Clearly I don’t share the wrongsome view expressed here by “papierpicker”. I’m prepared to pay big bucks for this device, assuming the contrast is good, and I ain’t alone.